WASHINGTON, DC - (@The Comedy News) - John Goodman's Jewish character in the cult classic film, "The Big Lebowski" refused to go bowling with his pals on Friday nights and Saturdays because he was "shomer [flipping] shabbos". Well move over, John Goodman, because the United States Postal Service (USPS) has gone Shomer Shabbos as well. As of this week, the USPS has decided that it will no longer deliver mail on Saturdays due to its observance of Shabbat from sundown on Friday through sundown on Saturday. "This brings us mailmen and mailwomen so much nachas," announced the Postmaster General. 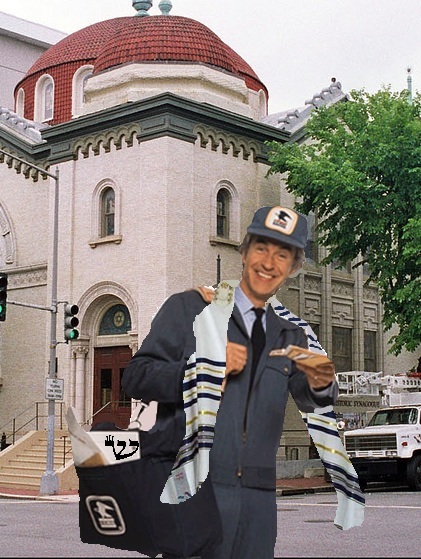 "Our mail-carriers will finally be able to attend their first Bar and Bat Mitzvahs---after years of suffering the indignity of delivering thousands of obnoxiously large gaudy invitations to these simchas each week---- yet never being able to attend one themselves." The USPS is clearly excited about this opportunity to observe the sabbath day and sanctify it. As a side bonus, the USPS hopes that the extra day of rest and unpaid wages will help the United States Government balance their stupid [flipping] budget.